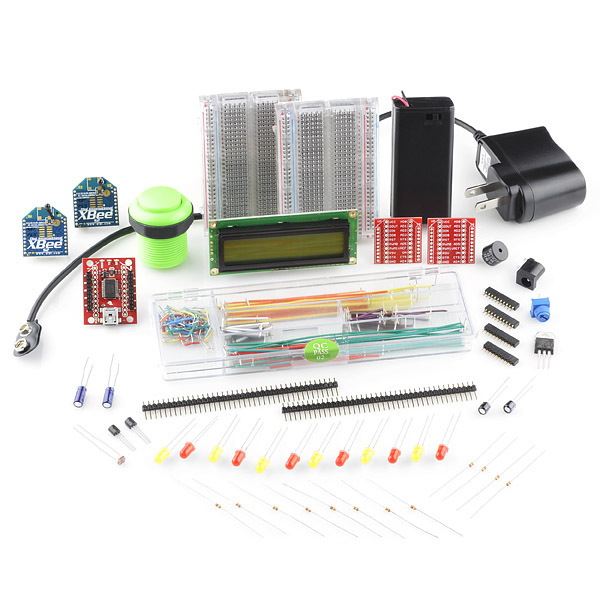 This kit was designed to accompany Rob Faludi's Building Wireless Sensor Networks book, which is the comprehensive guide to ZigBee wireless networks. This kit includes many of the parts and pieces you will need to work through the examples in the book. If you're serious about learning everything you need to know about XBee networks, this kit and the book will get you up to speed in no time (or as long as it takes you to get through the book). Note: The kit includes everything listed below and in the pictures. It includes many, but not all of the components needed. You may need an Arduino and some other components. This kit is not meant to be all-inclusive as you may already have some of the parts necessary. Note: This kit currently includes a TMP36, but the manual references a LM335. Check this page for updated instructions. Note: This product is a collaboration with Rob Faludi. A portion of each sales goes back to him for product support and continued development. Why do people cry so much about a flippin' power adapter when most likely they have random adapters lying around from old electronics that would work perfectly. I know I have many lying around. any idea when this might be back on stock ? 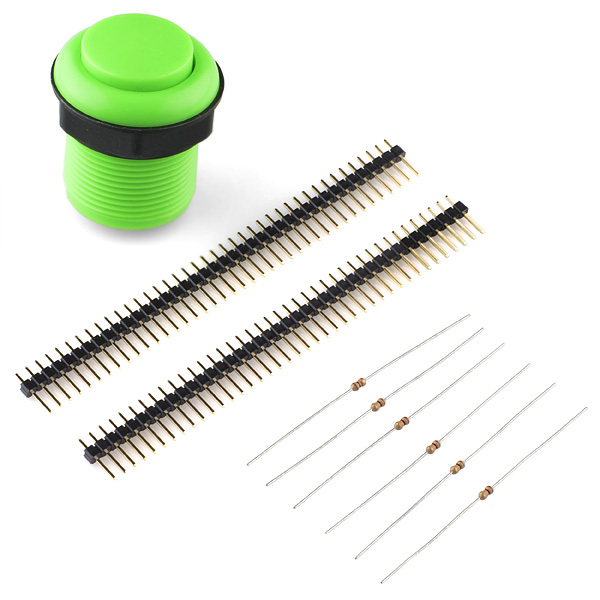 Why do Sparkfun still putting a US wall adapter to the kit? No good for the rest of the world. Think global. 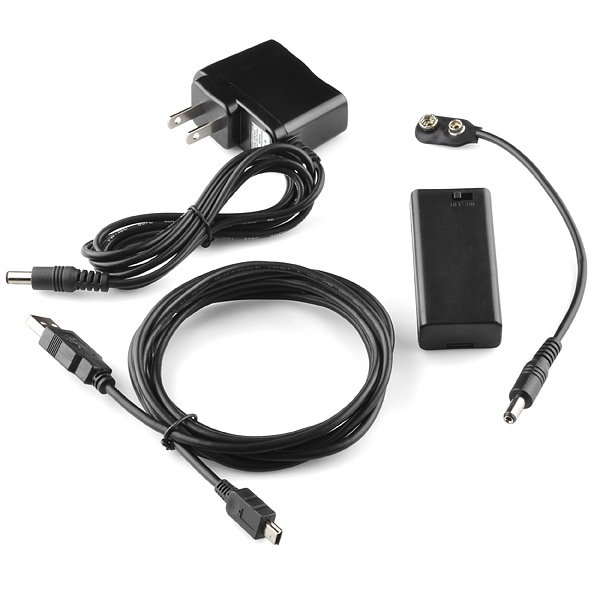 the wall adapter accepts 100-240vac, so you can use it you just need an adapter. The point of a "kit" has always been that it's got everything you need to have a good jumping off point, or accomplish a specific function. I would be angry if I bought a kit and it didn't have everything I needed. However, if I already have parts relevant, I don't usually go for the all inclusive kit. It's perfect the way it is Sparkfun, don't change it. I won't buy it, because I already have the majority of those parts, but that's exactly why I don't need to buy kits anymore. For someone who needs a little hand holding to get started, a complete kit is far better than saying "buy this, but you'll also need to grab these other things separately"
However, on the very first example in the book (Basic ZigBee Chat), on page 50, in the list of items need is "Two XBee USB adapter boards". However this kit only has one XBee Explorer USB, so I can not even do the first example in the book, much less all of them.. bummer. Yeah. Puzzled about that too. The simple sensor network in chapter 5 calls for two LM355 temp sensors (with a SFE part number given). But even if TMP36 is a substitute there is only one. And only one 3.3v regulator. Course... That makes sense since there are only two radios (the example calls for three). Maybe... "This kit contains many of the parts you will need to work through variations of some of the examples in rhe book". I agree with you dav1dr4y,, The description should be changed to something like that. The description has been corrected. This kit is intended to provide basic parts, and was conceived to be paired with an extended kit that contains the remainder. That extended kit is still in the works. Let Sparkfun know if you're interested in having it available. Now you tell me that I need the extended kit. Hey! Spark fun- sign me up for extended kit. 1 extended kit here as well. I just ordered the kit above and decided to read the comments. I still need more bits? 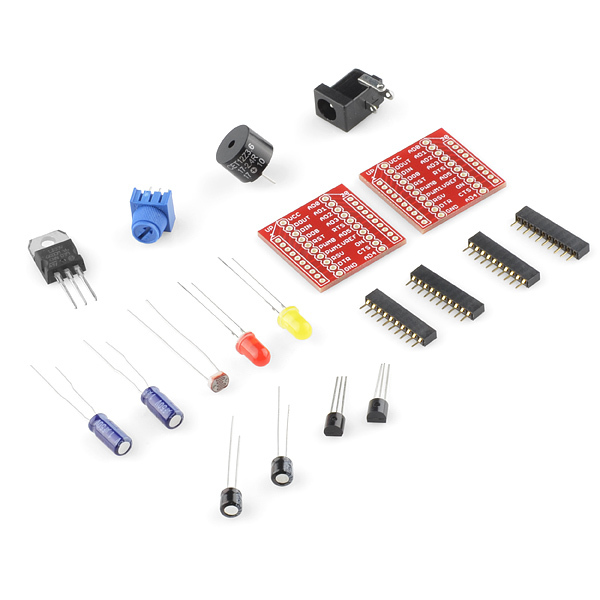 People may as well complain about the kit including resistors, LEDs, and breadboards as well. "Gee, anyone who owns electronics should have a breadboard." \Getting rid of the adapter, (the inexpensive, high quality one that SparkFun themselves recommend, check the product link for more info!) would reduce the cost of the kit by about $6, or ~5%. If you don't want it, pick and choose from the list of included components and make your own "kit". Kit is a fantastic way to start a path into building wireless networks. For me in particular I want to gage stream channels and turn on chicken coop heaters. Everything works great, and excited to test out the LCD screen. Only problem is that it does not come with an arduino uno or even the sparkfun redboard. Most everything I want to try in the associated book requires at least one of these boards to wirelessly communicate with the zigbee radios. If it just came with 1 redboard, that would make my day, so I just ended up buying two separately. Okay, I currently have NOTHING. So what more do I need to have everything required? I see there is discussion of an extended kit, but that is from 3 years ago. I'm guessing that there has been no such kit developed. I really do want to experiment and explore, but I don't want to be continuously disappointed and frustrated and be continuously ordering. paying for, and awaiting delivery of yet one more component. 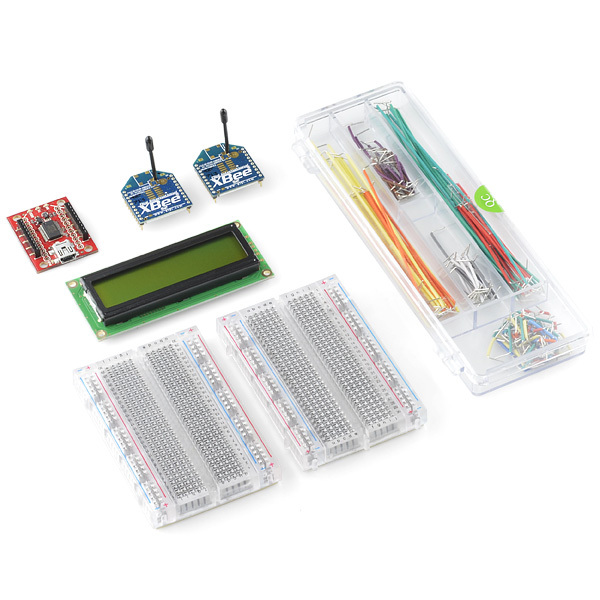 This may be a long dead conversation, but something for SparkFun to consider: Why isn't this a "kit of kits"? particularly since the "basic" nature of this kit is to avoid duplication of other (undisclosed) parts that someone may already have (which is paradoxically contradicted by having parts that someone already equipped in the undisclosed parts undoubtedly has). It would be nice if the kit came with an A-to-B style USB cable instead of a mini-USB cable. I currently have 5 of the latter and 0 of the former. I finally got to opening my BWSN Basics Kit and I'm really disappointed to see that I was sent series 1 radios instead of the series 2 radios they used in the book! This is really frustrating as I just ordered another Xbee Explorer USB and waited for that to arrive to begin the book. Now that it has arrived, I'm going to have to wait again for the series 2 radios!! BWSN Basics Kit should include 2 breadboards.but I just saw one in my mail when I opened it. Sorry about that, contact customerservice@sparkfun.com and they'll get you taken care of. well I got a second pair of eyes on the problem and my mate picked it up almost straight away. I received the wrong Xbee modules with my kit. They are the older 2007 maxstream ones. I aquired a pair from a local distributor and TAA DAA... we're back in business. Oh well, I suppose you cant have too many Xbees on hand. I believe that the earlier version of X-CTU will work with them. So, I tried to make a wishlist with a complete kit for this book and here's what I came up with. It has everything except the 2x - 1.0uf 50v capacitor. I'm glad to see this kit. Now that I have move past basic analog electronics and am gaining an understanding of how to use and program micro controllers, wireless sensors are next on my list of things to understand. While I see that the list of items in this kit does duplicate some of the items I've already acquired, the convenience of having everything in a single package makes it very attractive. Living far from any retail supply source, and having limited time for playing with electronics, I would far rather have a few duplicates than find myself stuck without a key component on the one day a week I have set aside to experiment with this stuff. There's a company called Sunny from China that sells good quality wall adapter with the head removable and changeable. I think you guys should sell that type instead and allow the customer to choose the head type. I've got to say, I hate most of those style adapters. In fact, I've had several that were so poorly made that they had a tendency to pop apart, leaving the hot contacts exposed. I think the concept (as it is generally implemented) is a safety hazard, and will not use them if I have any other option. Adapter are ugly and add to the cost of the kit. Well cost and ease of use are the answers. first of all i believe that since spark fun is based in the United States it's easier for them to get the US power supplies. Sure they could get a supply of non US power supplies, but what would they replace it with? There are a few plug types in use over the world. I don't have the demographic of sparkfuns customers, so this is a guess, and I'm sure it's possible for Sparkfun to just not include a power adapter all together, but who wants that? It raises the cost by like what, 5 bucks? stop complaining. if you don't like it, you could desolder the internal parts and throw them in your parts bin, for future use.